Along with some great supercharged vehicles there are a couple supercharger kits planned for debut at the November 2nd to 5th, 2010 SEMA Show in Las Vegas. Here’s a look at them. 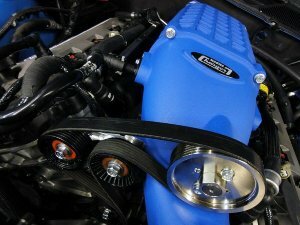 The ProCharger Stage II System and Tuner Kit for 2011 Ford Mustang 5.0l. ProCharger strikes the hottest iron which seems to be the 2011 Ford Mustang GT 5.0l. This well established company is debuting an already available supercharger kit the ProCharger Intercooled Stage II System and Tuner Kit. The kit is 100% complete and includes a P-1SC-1 ProCharger self-contained centrifugal supercharger, a front mounted 3-core air-to-air intercooler and a 8-rib dedicated supercharger drive system (a 12 rib is supposed to be available as well) and it all fits under a stock hood. The complete package is supposed to provide 7+ psi of boost and 180 HP to a stock engine running high quality pump gas. When all is said and done ProCharger says your stock 2011 5.0L will be pumping out 615+ flywheel horsepower with their new Stage II Supercharger System and Tuner Kit. Magnuson is also gunning for the 5.0L Mustang crowd with their 2010 SEMA Magna Charger debut. 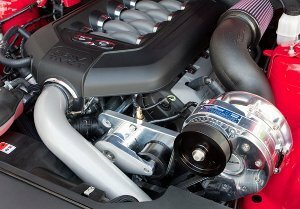 The company is keeping quiet about their new system but many speculate the new kit could be based on the TVS 2300 blower which is used in the Roush and Whipple supercharger kits. They have leaked some pictures. Shown is the new kit in grabber blue. Rumors have it the final product will be available in blue, black and chrome.